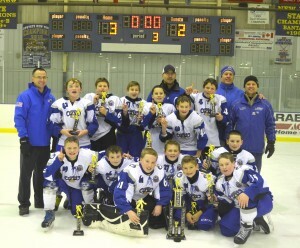 The Step One Creative Peewee Bucs defeated the Syracuse Blazers 3-2 Sunday in the championship game to win the 2015 Best Western Plus Invitational Hockey Tournament. In the preliminary Peewee Red Division games, the Bucs tied the Blazers 3-3, defeated Southend B (Ottawa) 6-0, Webster 4-0, and Southend B3 (Ottawa) 4-1. Shown pictured from left to right kneeling are: Joe DiBlasi, Lukas Cady, Hunter Lawton, Marcus Baker, Spencer Stepien, Cole Cullinan and Noah Delaney. Left to right standing are: Coach Phil Cady, Patrick Galvin, Keith Vivlamore, Tyler May, Aidan Taylor, Head Coach Frank Brosch, Tommy Back Back, Bryson Bush, Coach Andy DiBlasi, and Coach Pete Cullinan.